Japanese Episode AG 183: "Haruka vs. Shuu! The Final Battle!!" American Episode 453: "Channeling the Battle Zone!" Haruka's and Shuu's battle at the Kanto Grand Festival continues! Shuu has his Flygon and Absol combine their attacks to form a Dragonbreath / Razor Wind combination, but Haruka is able to rebound by combining her pokemon's fire and water attacks the way the Dome Superstar Heath did in his battle with Satoshi. Eventually, Zenigame is able to take out Flygon with a close range Ice Beam, but Absol takes out Zenigame before it has a chance to land. Now, the match becomes a one-on-one battle against Shuu's Absol and Haruka's Wakashamo. During the heat of the battle, Haruka's pokemon learns Overheat and is able to use the attack to weaken Absol. At the end of the battle's five minute time limit, Haruka is declared the winner by a slight margin! Happy at finally beating her rival, Haruka congratulates her pokemon on a job well done. As the Grand Festival continues, Satoshi faces off against Aipom again and finally manages to capture it! Later, Haruka and Saori are pitted against each other. 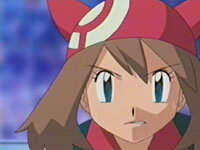 The Coordinator from Nibi City is able to battle at her own pace and eventually defeats her opponent. Though Haruka is disappointed at first, she realizes that being in the Top Four is a really great achievement and cheers up by the time of the post-festival party. Later, Haruka tells Shuu that she'll meet him again before he heads off to train for the next Grand Festival. Next up is Satoshi's turn to face Jindai in the Battle Pyramid located in Fennel Valley. Can Satoshi defeat the final Frontier Brain? The Haruka vs. Shuu fight is just awesome. No cheap wins, good techniques being used on both sides, excellent animation and directorial decisions...it has it all. Still, everything is way too rushed in this episode. I mean, would anyone have complained if the Grand Festival was given a fourth episode so the Haruka vs. Saori fight could have been given more of a spotlight (and so Saori could actually get a proper send-off)? Or, at the very least, move the Satoshi catching Aipom stuff to the next episode so that this one has more room to work with? Hopefully, the Shin'ou Grand Festival will be given the same amount of spotlight as a Pokemon League and the pacing problem will be fixed. The dubbed version doesn't really stand out. Most of the Japanese music heard in the Haruka and Shuu battle is kept, so that's great. Pigeot keeps its Japanese voice. When Satoshi battles Aipom, the current opening theme of the show, Spurt!, plays in the background. This is taken out of the dub. A one-second fade-in to the battle between Haruka and Saori is removed due to the placement of Cartoon Network's commercial breaks. The TO BE CONTINUED... screen is three seconds longer in the U.S. than it was in Japan.